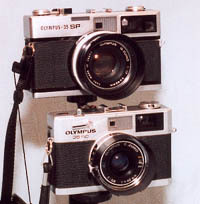 The Olympus 35 Rangefinder Cameras. The Olympus 35mm fixed-len rangefinder cameras feature both a semi or full auto mode and full manual override capabilities. Why would anyone shoot with an old film camera that is more than three decades old? The superior performance of using a full frames 35mm sensor versus small sensor digicams. A single-focal-length, prime lens offers superior performance over a consumer-level-zoom lens on a compact digital or worse on a cell phone. There is no shutter or focus lag in a low light situation. With an optical viewfinder, there is no electronic viewfinder or display lag, either. The photographer picks the focus point, not the camera. The rangefinder camera is usually always on. There is no boot up. Battery life on a film camera is measured in months versus hours. For less than $150.00 USD - 35mm film cameras is comparable to a 12 megapixel digital camera with a slightly smaller APS-C sensor in resolution. Image quality: with a compact fixed-lens rangefinder you are using a full-frame 35mm sensor. Sensor size matters. In the arena of compact digital cameras, they may use a sensor whose physical dimensions are smaller than the finger nail on your little finger. Resolution captured on 35mm film will outperform most compact digitals with under 12 megapixels. On the other hand, full frame 35mm digital cameras will not only match, but far exceed the image resolution of a 35mm film camera. Keep in mind that full-frame, digital cameras are not usually compact, nor are they cheap. One outlier which is compact would be the ostentatious Sony 42 megapixel DSC-RX1 RII fixed-lens digital camera retails for over $3000 as of this writing - and - it suffers from a short battery life. Oh, but what a lens, it is fitted with a Zeiss 35mm, f/2 Sonnar. With that said my most recent fixed-lens 35mm purchase was a mere $75 US. It's a nearly 70 year old Kodak Retina IIa. The Retina IIa is a textbook example of how to build a pocketable camera around a decent 50mm f/2 lens. In addition the sensor size, it is the lens that affects image quality: Most compact 35mm fixed-lens rangefinder cameras listed on this page have lenses of a quality that equal the removable prime lens used for a full-sized 35mm SLR. Fixed-lens cameras do not allow the photographer to remove the lens. Affordable fixed-lens digital cameras do exist but most use a zoom lenses that are built to a consumer cost level. The result - a typical consumer level zoom lens will suffer from lack luster resolution towards the corners of the frame and distort straight lines at its extreme focal lengths. Furthermore, a single focal length, prime lens as fitted to an old compact 35mm rangefinder camera will have a wide open aperture of at least f/2.8 versus f/4 of a consumer zoom lens. Many, but not all, compact fixed-lens 35mm rangefinders offer a f/1.7 aperture, which allows for a hand-held exposure in a normally lit room without having to use a flash. Ergonomics: there are only three controls on a fixed-lens rangefinder camera - aperture, shutter speed and focus. Hence, there are no menus to scroll through, nor a multitude of buttons to search for. If need be, most fixed-lens rangefinder cameras can be operated 100% manually without using a battery. Before taking a look at some of these fixed-len 35mm rangefinder cameras, I want to mention a more affordable film camera alternative in 2019. When this web page was written in 2002, a 35mm SLR was triple the price of a compact 35mm rangefinder. Now the pricing situation has reversed. The days of picking up a working 35mm fixed-lens rangefinder are about over. 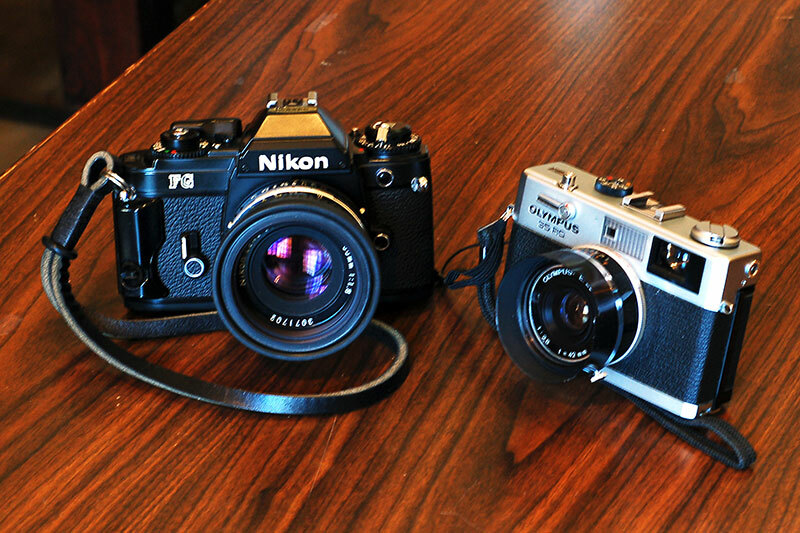 Today, it's not that difficult to find a 35mm SLR with a good enough lens for under $50. Albeit, the SLR is a larger package and much noisier - but the question of paying more for a camera that can only be used with a single lens can lead many to ask: "How much bang should we get for our hard earned greenbacks?" Another consideration is that not all fixed-lens 35mm rangefinders have aged well, 40 plus years down the road. Some but not all are cursed by gremlins. 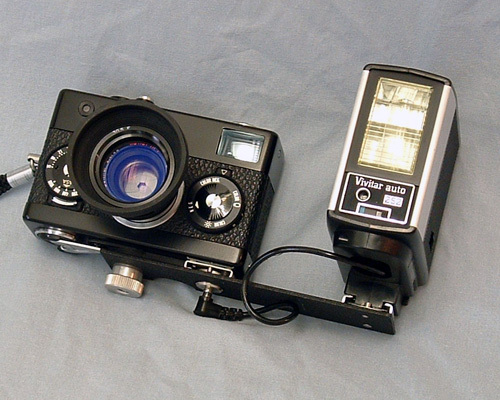 One example is the Olympus 35RD, which will be mentioned below. Its mechanical shutter tends to gum up with age. On the other hand, the Olympus 35RC shown in the above photo besides a Nikon FG still works well. The 35 RC has a nice enough lens for such a small camera, but it definitely a less capable camera than nearly every 35mm SLR cameras built between 1975 and 1984. Relatively compact SLR's like the one in the above side by side comparison were commonly available by 1982 and so were their electronically controlled shutters. The key phrase is relatively compact. In addition to their noisy shutter slap, they are still a bit bulky to slip into a winter coat pocket. With regards to the electronics of the era, that too can be a fly in the soup. The electronics of many SLR cameras from 1980 may have their own gremlins 40 years down the road and are unrepairable. If battery consumption is a concern with this 35mm SLR genre, look into an all mechanical Pentax MX, (which were indeed compact when compared to other full-sized SLR competitors) or a slightly larger Nikon FM. Granted that their will be issues no matter what, such as mirror pads and light seals in need of replacement on a 40 year old Japanese camera - but I'd be remiss with regards to value per dollars spent by not mentioning how affordable 35mm SLR's have become. For replacement light seals for any camera shown on this page, send an email to Jon Goodman at jon_goodman@yahoo.com - be sure to include the words, "Light Seals" in the subject. 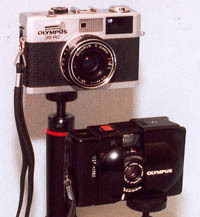 The Olympus 35 RC is the smallest camera pictured at the top of the page and the one with the best ergonomics. It is also semi-pocketable, provided that the photographer is wearing trousers with baggy, front pockets or better yet a coat with large pockets. Although the 35RC is essentially an entry level 35mm rangefinder camera, its metal body has a a superb fit and finish which is rarely scene on point and shoot cameras from the 1990 Era. The 35 RC also has a highly regarded lens, plus a traditional ergonomic design that is common to larger 35mm cameras. Unlike the Nikon SLR shown in the comparison image, the 35RC is able to use its full range of shutter speeds without a battery -which is a plus when on vacation. There are more advanced 35mm rangefinder cameras to choose from - but the Olympus 35RC captures the essense of 35 mm photography in a wonderfully executed compact package. Introduced by Olympus in 1970, the 35 RC is one of the smallest classic 35mm camera with rangefinder assisted focusing. It fits nicely in svelte belt pouch. The camera includes a metered, semi-automatic, exposure mode - in addition to its non-metered, full manual override mode. That manual mode is important, as it insures that the camera will be operable should its battery fail when on vacation. A definite step up from the base Olympus Trip 35 - from which it shares the basic chassis, the 35 RC keeps it simple and affordable by only providing six shutter speeds - something which becomes the camera's weak point in low light. Like a Trip 35, it's shutter assembly is behind the lens. The shutter speeds range from 1/15 to 1/500 of a second, which suffice for hand-held photography in good light. Both its manual mode and flash mode are meterless. Its battery dependent, auto exposure mode relies on a CdS light cell that is mounted in the lens barrel. Most users will prefer this battery dependent auto mode - but for keep in mind that the 35RC is able to provide for an old-school photography by switching to the camera's unmetered manual mode. With regards to optics, the f/2.8, E. Zuiko, five element lens is no slouch at f/4 and offers tack sharp resolution by f/5.6. The five element Zuiko delivers very good contrasty images. The aperture can be set manually from f/2.8 to f/22 - or - one can select the AE setting, which will allow the RC to select the aperture automatically. The lens uses the same 43.5 mm filter size as the lesser equipped Trip 35, These filters and lens hoods are now very difficult to source - but they do exist. For indoor shooting one installs a manual flash unit with a known guide number and let the mechanically coupled flashmatic-mode select the correct aperture. The quote, unquote "flashmatic system" is totally mechanical and it works quite well. With its traditional ergonomics, rock solid dependablity and superior range finder, the Olympus 35RC is consistently easier to focus than the Rollei 35 and its larger viewfinder/rangefinder are vastly superior to the micro-rangefinder fitted on the Olypmus XA. In stark contrast to the XA, the 35RC accepts the same filters and lens hoods as the Trip 35, 43.5mm. The more evolved Olympus 35 RD is a higher-spec'd progression from the Olympus 35RC. The purpose of the RD was to replace the well regarded 35SP in the Olympus line up. Introduced in 1975, the 35RD was to be final, old-school, compact 35mm rangefinder from Olympus which would allow for a battery-free manual mode. Electronics and plastic were poised to take over the market towards the end of the 1970'ies. If the Olympus 35 RD weren't today so in need of repairs, this would be the compact 35mm rangefinder of choice. Essentially, the 35RD is a 35RC on steroids. It is a splendidly compact, but heavy shooter for its size. The 35RD is densly packed with a new set of mechanicals - which extend the shutter speeds down to 1/2 second and its 6 element lens adds some heft as well. It's not really pocketable - unless one uses a strong, very well-made, coat pocket. Service Issues: The 35RD will need to be properly repaired to bring it up to speed before using it. The Olympus 35RD has a nice grease dampened, unit focusing lens, that carries with it the curse of impending doom. On the 35RD, the helical grease for this assembly has a definite tendency to separate in such a fashion after a three decades so that the liquids componenenst migrate onto the between the lens shutter and aperture blades. The behind the lens mounted shutter of the non-unit focusing 35RC does not have this problem, nor does the unit focusing 35SP. Bottom line: if this issue hasn't been remedied by a previous owner - there is a 99% chance your Oly 35RD's will need the shutter/aperture assembly to be serviced. Also, be sure to have the helical grease replaced with a modern silicone grease that doesn't migrate. This is a professional repair and makes an already expensive camera even more expensive. With all that said and a plug for three of its competitors - I still prefer a properly serviced Olympus 35RD as my grab and go camera. I generally shoot in the shutter preferred auto mode, in which I pick a shutter speed appropriate to the lighting conditions and check which aperture the camera will choose. The Olympus 35 RD has a full range of shutter speeds from 1/500th to 1/2 of a second. Its fast F Zuiko, f/1.7, six element lens is a unit-focusing design. The lens on the 35RD is twice as bulky and much heavier than the old-school, front cell focusing E Zuiko, which was fitted to the 35RC. The fast f/1.7 lens allows for shooting in very low - (do note: that the user must set the focus with utmost care when shooting wide-open). While the F. Zuiko lens is not as clinically sharp wide open as the seven element, G. Zuiko lens on the older 35SP - the photographer can use the automode in much dimmer ambient light than is the case with its older brother. Also, its metering cell is inside the filter ring of the lens, so that filter compensation is automatic. Introduced in 1969 and using the fine 7 element lens found on the mid-1960's Olympus 35 LC , the Olympus 35 SP is a mechanical testament to some of the best camera engineering of its time. In many ways the 35SP resembles a late 1950's or early 1960's fixed-lens rangefinder, albeit on steroids. As such, it is as large as today's compact SLR's. However large it may feel, it is still the best image taker in this class of rangefinder cameras. I like the 35SP because it offers two unique features. First, Olympus 35SP features an uncommon metered-manual mode. Most other rangefinders of its day required the photographer to switch over to the auto mode to take a light reading and then return to the manual mode. Second, the 35 SP is the only fixed-lens 35mm rangefinder camera with spot-metering capability. If those two features aren't enough to give the Olympus 35 SP a test spin, let me add that the seven element, G. Zuiko lens is the best I've ever had the pleasure to use on a fixed-lens 35mm rangefinder. Many photographers find the Olympus 35SP to be a bit archaic. Then again, others will be right at home with its full auto mode, that permits the photographer to just focus and shoot without having to set the aperture or shutter speed rings. One hiccup, the 35SP metering cell is located outside of the lens barrel. In this case, it is on the camera body adjacent to the viewfinder. The downside of this location for the metering cell is it does not automatically compensate for different lens filters as later cameras do. In a true throw back to the late 1950'ergonomics, the meter is calibrated in exposure values or EV numbers. This is not a problem for photographers that have used an old-school, hand-held meter. A final note regarding Olympus 35SP: It is definitely not a compact rangefinder camera. It would have been nice to see a design which allowed the lens to retract into the camera body - as is the case with a Kodak Retina from circa 1950. The Retinas featured an excellent 50mm Schneider-Kreuznach Xenon, f/2 lens. Something that may seem insignificant at first glance is that each of the above Olympus cameras include a "flashmatic" mode that will set the aperture automatically as the camera is focused when using an indoor flash. With the correct guide number flash unit, one can expect near perfect flash exposures, so long as he or she accurately focuses on the subject. It works extremely well. Rangefinder-assisted focusing is what made 35mm film-based photography so popular during the Mid-20th Century To focus a rangefinder camera the photographer need only to line up two images in the viewfinder, while rotating the focus adjustment on the lens barrel. As opposed to the Olympus 35mm rangefinder cameras shown on this web page, there are rangefinder cameras that allow for interchangeable lenses. - most were popular back when the 35mm SLR was still in its developing stages - awaiting the introduction of instant return mirrors and instant return lens aperture mechanisms. The "old timer" shown above has what is called a un-coupled rangefinder, which has a dial that is adjusted as the user peers into an eye piece. 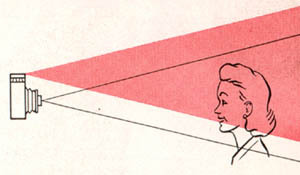 The RF apparatus is not mechanically connected to the lens. So, the photographer must then adjust the lens focus as a separate step after reading a dial on the rangefinder. A second old timer shown below is my Leica II from 1932. The Leica II was the first 35mm camera with a rangefinder apparatus that is "coupled" to a cam in the lens barrel. The linkage coupled to lens barrel allows for single step focusing. If you are novice user - A coupled-rangefinder refers to the built-in apparatus that allows one to accurately focus the lens via the use of two super imposed images that appear in cameras's viewfinder. Rotate the focus ring of the lens and when the two rangefinder images align perfectly in the viewfinder, the lens is focused to that selected distance. Not all rangefinder cameras are equal when comes to focusing precision. For example: 1932 Leica II will more precisely focus a fast f/2 lens at wide open aperture than any other compact 35mm camera mentioned on this web page. 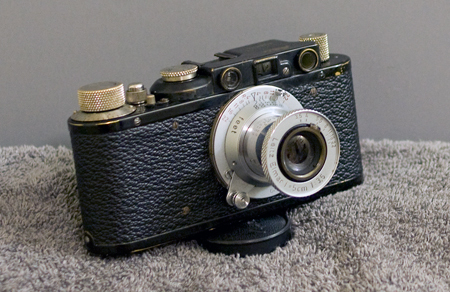 By 1950 camera makers began in earnest to combine the rangefinder image with the main viewfinder image - so the camera no longer has two eye pieces to look through - as was the case with the Leica II, shown above. 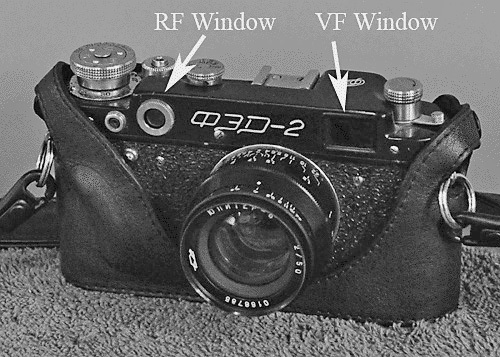 Nearly all rangefinder cameras built after 1956 utilize a combined VF/RF. Since rangefinder focusing is accomplished by lining up two separate images so that they are lined up with each other - this requires at least two separate windows at the top of the camera. On a fixed-lens 35mm rangefinder the main viewfinder image that one sees through the eye piece is gathered by an optical lens that is located behind the front viewfinder window. The main viewfinder window is usually the larger of two windows located on the camera's top cover above the lens. The second forward facing window is the rangefinder window. It is off towards the center of the camera by an inch or more. More is better. On an Olympus this window the RF window is directly over the lens. The RF window is typically much smaller than the main viewfinder window and often unnoticed by the novice user. One can put their finger over the rangefinder window and watch the yellow focus patch disappear when viewing a scene through the viewfinder. This may also occur when the photographer uses a wide flaring lens hood. So, try not to block the field of view of the RF window while focusing the lens. All a rangefinder novice needs to really know about the rangefinder mechanism is that the image within the yellow patch moves sideways as you turn the focus ring on the lens. Simply, rotate the focus ring until the two superimposed images match and you're done. That, in a nut shell, is how a coupled-rangefinder works. Nearly all non-SLR cameras have an external viewfinder. The image that you see in the viewfinder does not precisely match the image that is recorded on film. This difference is due to a phenomenon called parallax. The above illustration shows the effects of parallax when shooting an extreme close up from a distance of about 3 feet from your subject. Parallax correction: professional-grade rangefinders have bright frame lines in their viewfinder that move as you adjust the focus. This allows the photographer to more accurately see what will be captured on film when framing close-ups. Viewfinder and rangefinder cameras without bright-lines that move as you focus will need to be tilted up slightly when shooting extremely close in to the subject. If not, you'll have photos of people without most of their hair or hat missing in the final photo. Olympus rangefinders, have framelines that don't move. Therefore, a second set of frame lines are provided for close ups. What is inside the frame-lines is approximately what you'll capture onto the negative. : Anything outside the frame lines will be cropped. I'm about done, but in case you're curious, the frosted glass or plastic between the rangefinder and viewfinder windows is for the lit backdrop with other information. Essentially it superimposes a third image into the viewfinder eyepiece. Behind the frosted window is housed the meter needle, the bright-frame marks and any other printed info that will be displayed in the viewfinder. Put your finger or a piece of tape in front this frosted panel and watch the viewfinder info disappear. Finding Replacement Batteries for the Old 1.35 volt Mercury Cells. Vintage 35mm rangefinders don't need their batteries installed to take a good photo in daylight, which is a major plus in my book. As a sign of the times, most rangefinder cameras were hand assembled with a multitude of mechanical gears and springs to operate the shutter mechanism. These gears and springs do not rely on a battery to function properly. With that said, the built-in light meter is definitely battery dependent and that meter is essential to the camera's auto mode or semi-auto mode. The original 1.35 volt mercury cell batteries used to power the light meter on most rangefinder cameras are no longer available. I prefer to use the Schottky diode adapter, which allows for the use of 1.55 volt silver oxide cell. The silver oxide battery cell will last more than a year. Another solution is to use a 1.4 volt zinc-air replacement cell. The zinc-air cell a essentilaly a modified hearing air battery that produces a close enough 1.4 volts. Some but not all camera shops carry them under the Wein brand name They don't last nearly as long as the old mercury oxide batteries. With a little ingenuity a $1.00, #675 zinc-air cell made for a hearing aid will work just as well. If you use zinc-air cells bring along a spare or two when travelling. During the 1970's rangefinders were the compact 35mm option of their time. Unless you wear a sport coat or some other jacket with baggy pockets - most compact 35mm cameras are not pocketable. With that said, there are some widely available used pocket 35mm cameras that come to mind - which deliver good to excellent 35mm photos. But, they do so with some definite compromises. Their smallness is a result of a less than conventionals design - which involves trade-offs. The two classic compact 35mm designs that best fit this genre are the Rollei 35 series and the Olympus XA. 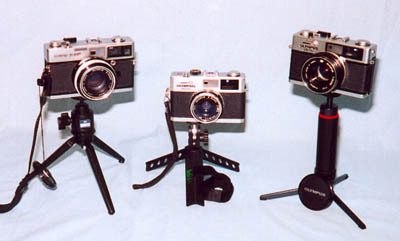 A third and fourth camera in this category, that not reviewed here, are the Minox, by Leica and the Contax T built by Kyocera/Yashica. The Rollei 35 - an example of "Technical Minimalism"
Introduced to the public in 1966, and about the size of a pack of cigarettes, the original Rollei 35 set a benchmark that all succeeding pocketable 35 mm cameras would be compared to. Rollei's early ads had the slogan, "The world of 35mm photography in the palm of your hand." A masterpiece of function versus form, the Rollei 35 draws heavily on a fine German heritage. It definitely found a niche and by 1977 two million Rollei 35's were produced. The original Rollei 35 incorporated components from the big three German suppliers, (Compur, Gossen and Zeiss), into a very compact and light weight package. The Rollei 35 was the last completely new camera system from any German manufacturer that would take the camera industry by storm. By the time of its introduction, the average 35mm camera had become quite large when compared to pre-WWII models. After World War II as new features were added the 35mm grew in size and weight to the point they were no longer comfortable to carry a coat pocket. With its legendary Zeiss Tessar lens is mounted to a sliding lens tube that collapsed in the body of the camera for storage, the Rollei 35 not only fit in one's coat pocket - but could also fit in a pants pocket without any discomfort. Add in a a Compur mechanical shutter with a full range of shutter speeds. that ranged from 1/2 to 1/500th of a second and includes B setting and the result is a camera that is ready of some seriously good 35mm photography without the usual bulk or weight. Both the Tessar lens and Compur shutter had been reliable standbys on German cameras for decades. A final German touch was the use of a Gossen designed CdS match-needle light meter at the top of the camera. The match-meter is coupled to the aperture, shutter and film speed controls. These are located on the front of the body of the Rollei 35. There is no rangefinder fitted to the camera. The two big drawbacks to the Rollei 35 design are that it lacks both an auto exposure mode and a built-in rangefinder to aid in focusing. This is no point and shoot 35mm camera. It's not a camera for either a lazy or the novice photographer. Once the photographer has manually set the exposure, he or she must guess the distance to the subject - then manually set the focus ring on the lens. It is a fiddly camera. The built-in light meter on a Rollei 35 isn't very sensitive in low light. It is a very capable meter down to about EV8 @ ISO 400, which means that meter is useless in a dimly lit interior room. EV8 @ ISO 400 is an aperture/shutter setting of f/2.8 and 1/500th of second. The light cell for meter is located outside of the lens barrel. Other quirks include an upside down flash shoe, a fiddly lock for the aperture wheel, a back which needs to be completely removed to access the film chamber and finally, the need to advance the film lever all the way through its stroke in order to stow the retractable lens. The above photo is a view shows the business end of Rollei 35SE. Beginning in 1974, the Rollei 35 was available with Carl Zeiss designed, 40mm/f 2.8 Sonnar lens. It is lens that makes the 35S and 35SE stand out from all the pocketable cameras that followed. The availability of the magnificent, 40mm Sonnar is the primary reason the camera is mentioned on this web page. While the original Zeiss designed 40mm Tessar lens is a repectable performer at even f/5.6 - the 40/2.8 HFT Sonnar lens delivers crisp resolution in a flat field all the way to the edges of the frame, even wide open at f/2.8. The Rollei-built version of the Sonnar uses a lens formulation of 5 elements in FOUR groups, (see Rollei 35 SE manual, page 42). Rollei added their in-house professional HFT mulitcoating to reduce lens flare - which increases contrast. Color rendition is rich and breathtakingly beautiful. When in proper focus and a tripod is in use, the resolution of the Sonnar HFT is capable of exceeding most prime lenses that are available for a full-size 35mm SLR. A major plus is that the Rollei 35 S and SE for such a small camera is that the lens is threaded to allow for the use of 30.5mm filters and a lens hood. This is a rarity for such a small 35mm camera. 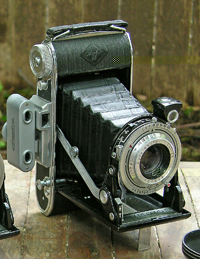 Both the 35 S and SE models retain the fully mechanical shutter from the original Rollei 35. Hence, the shutter mechanism couldn't care whether or not a functional battery is installed in the camerait. Shutter speeds on both models range from a 1/2 sec. to 1/500th of a second. The main difference between a Rollei 35 S and the newer 35 SE is that the latter uses an array of electronic LED exposure indicators located within the viewfinder to set the exposure. Another difference between the two cameras is that the meter on the 35 SE version seems to work just fine with an available 6 volt S27PX battery and its battery cell. The battery on the Rollei 35 SE is installed in the top cover plate of the camera - which allows for a battery replacement while the film is loaded. The older Rollei 35 S on the other hand - which had originally used a mercury PX625 battery - now needs a converter in order to use a MS76/SR44 silver oxide cell. Last but not least, the battery for the 35 S is inconveniently installed inside the top the film chamber and difficult to get to. Bottom line - both the 35S and 35SE will yield stunning photos or slides when the camera is in capable hands. As a user friendly alternative to the Rollei 35 S or 35 SE, there is none other than the Olympus XA . Introduced in 1979, its clam shell design was nothing short of revolutionary for a Japanese rangefinder and it was tiny for its time. The XA is more like a Yashica Electro 35 in its operation than the Rollei 35. With its built-in coupled rangefinder apparatus - it is much easier to set the focus on an Olympus XA versus a Rollei 35, which leaves it up to the photographer to come up with a guesstimate. Introduced in 1979, it quickly gained acceptance as a back-up 35mm to the by then prerequistie SLR outfits. It does come with a few trade-offs - which are mentioned in the next section. As is the case with any 1980's camera, all metal construction started to give way to plastic. The XA's modern design doesn't accept filters. In other words, there are no filter threads on the lens. When it comes to spur of the moment photographes - seconds matter. If it takes you two or three seconds to manually set the exposure, the decisive moment may be gone. The Olympus XA will always set the exposure automatically. There is no manual exposure mode. An aperture preferred AE means that all the user needs to do is set the aperture, focus and trip the shutter. With the camera placed on a tripod or resting on a wall, the AE mode on the XA will permit exposures in low-light for up to 10 seconds. No provisions were made for a separate flash hot shoe, but the available proprietary flash units are convenient to install and use. Finally, there is single lever that activates an electronic self-timer and a "back-light" exposure compensation mode. Both features cannot be used simultaneously. The electronically controlled shutter means the camera will be dead in the water if the batteries ever give up the ghost. Unlike most of compact 35mm rangefinders from a decade before - the Olympus XA works fine with readily available silver oxide MS76/SR44 batteries. In defence of the Olympus XA, its design is so elegantly simple that a novice photographer can begin using it immediately. The main advantage of the Olympus is that it utilizes an integrated circuit to automatically operate an electronically controlled shutter - which - as mentioned, makes for convenience and quick shooting. Its light meter utilizes a superb silicon photo diode and performs well even in a very dimly lit room, unlike the Rollei 35. On a Rollei, the photographer can preset the exposure without extending the lens. Albeit in a dimly lit room or night scene, this will have to be done with a separate hand-held light meter. One fly in the soup that comes with the automated exposure system on the Olympus XA is it lacks an AE lock. The camera does have a +1.5 EV exposure compensation lever for back-lit subjects on the bottom of the camera - To go the other way in regards to exposure compensation, the photographer must deal with a very fiddly film speed dial at the front of the lens. The Rollei 35 on the other hand is alway fully under the photographer's control, because the camera has user selectable aperture and shutter speed dials - which must be manually set. Take note also, that the XA, like nearly any modern electronic camera since 1980, will cease to function should its batteries ever give up the ghost. With the Rollei or many of the older fixed-lens rangefinder cameras from the 70's, the photographer will be able to soldier on - so long as if he or she can forego using a light meter and instead use the "Sunny 16 Rule" to set the exposure. While the minuscule rangefinder focusing of the XA patch offers a more precise means of focusing than the Rollei's guesstimation method, - the rangefinder patch isn't as large or nearly as bright when compared to the electro-mechanical, fixed-lens rangefinder cameras from the 1970's. Lastly, at wide open apertures, the 35mm Zuiko lens is no match for the 40mm Sonnar of the higher spec'd Rollei 35S and 35SE. The images of the XA shot at f/2.8 show pronounced vignetting in the corners of the frame. To be fair, the image quality from a 40mm Sonnar is hard to beat even with a full sized SLR. Lastly, the lack of the ability to use filters with the XA is almost a show stopper with regards to B&W photography. To get the convenience of an Olympus XA and a Zeiss designed Sonnar in one package, the photographer will need to step up Kyocera / Yashica built Contax T - which in addition to a superb lens, has a better rangefinder design than the Olympus XA. We live in a time which at least a billion plus people are perfectly happy with the images captured on their mobile telephone. So much so, most will never invest in a dedicated camera. In this context, a compact 35mm still serves me well and compliments my Nikon digital SLR gear. The hottest selling new digital cameras for serious photo enthusiasts are mirrorless with an electronic viewfinder rather than the traditional SLR which has an optical finder. The most rangefinder-like mirrorless digital camera on the market in 2019 is the Fujifilm X100F. It is a fixed-lens, APS-C sensor sized camera that retails at over $1000 US. This camera has a hybrid optical and electronic viewfinder. But more importantly, the X100F has a traditional control layout that which consists of analog dials for the aperture, shutter speed, iso speed and focus. The focus dial could use some improvement, but the point here is only a few digital cameras are built this way. Back to using a film camera in 2019 - it isn't always easy being a film photographer in 2019. In a city of nearly a million, there is only one local camera shop in my area that even sells the chemistry needed to develop film. When I travel to other cities, finding a roll of Kodak Tri-X locally isn't always practical. My old-fashioned wet darkroom more than paid for itself more than twenty years ago. It cost me way less than a dollar to develop a roll of black and white film. Compared to the modern push of the button printing that some folks use for their digital images, the wet darkroom makes you earn your images. My analog darkroom is still in use, but I print less frequently than in previous years, mainly because I'm using two different scanners to digitize film images. It is a bit ironic that since the purchase of a dedicated 35mm film scanner, I'm using more film than I did in past years with an analog only workflow. Sales of film plummeted from 960 million rolls a year in 1999 to about 20 million rolls per year by 2009. The good news is that there were 26 million rolls of film sold in 2018, which is still only about 3% of the peak sales for the medium 19 years earlier. There is probably doubt in corporate boardrooms about the film medium's future. The men in suits want to make an easy buck. Consequently, there are far fewer companies left that offer a full line traditional products. The range of film offerings for these pre-existing cameras has dimished and will be more expensive in the future. With the exception of instant film, film cameras for mass markert are no longer in production. Used film cameras will be around in 10 years, but other than Leica, no one is making them in appreciable numbers. The bottom line: A medium that had once been the mainstream of photography has become a niche market. Color films may not survive in this residual market. Black and film sales on the other hand have slowly increased in the past few years, mostly in Europe and the US. As an imaging medium, I'm still drawn to black and film, which has a certain look that a 24 megapixel digital image in all its clarity lacks.